Models Direct favourite Daisy Lowe was turning heads (as usual!) at this season’s Fashion Week in Milan. Modelling for Dolce & Gabbana, the 20-year-old supermodel donned a provocative, unique and interesting red outfit, which left little to the imagination! There are rumours that the former London socialite will be returning to her British roots in 2010 after appearances in the city over London Fashion Week and after breaking up with on-off boyfriend Will Cameron, whom she moved to New York for. What do you think of Daisy’s look in the images above? 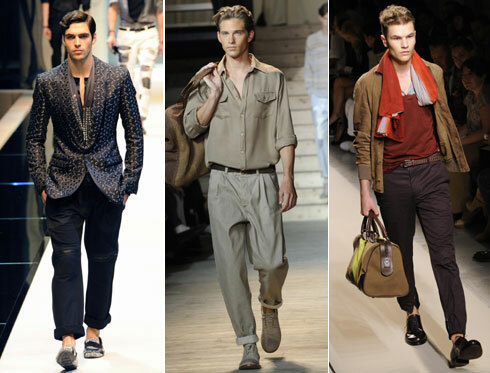 Here are Models Direct’s top ten trends that came out of Milan fashion week for 2009, some are more appealing than others! 1. Pockets and plenty of them. Pockets have been commented on in one of Models Direct’s previous blogs, showing that Roger Federer was ahead of the fashion trends in his multi-pocketed jacket at Wimbledon. 2. Combat shorts… or just shorts in general. (Another item of clothing to add pockets to). We could soon be seeing men in short shorts… a good or bad thing? 3. Roomy trousers. Men should be ditching the skinny trousers (well, it was probably more boys than men wearing them in the first place) in favour of a more spacious pair. And if you’ve got nice shoes, roll them up at the bottom and have them on show. 4. Animal print. Zebra stripes, leopard print, snakeskin effects? In my opinion, this one’s better left on the catwalk. 5. Grey. Prada’s men’s show featured interesting, more casual variations of a grey suit. I like this look, I’d maybe like a splash more colour though. 6. Pale denim. Shirts, jackets, jeans, whatever really, as long as they’re pale! 7. Coats – Parka or Trench? This is apparently the debate of the season. I vote trench. 8. Small bags. And I mean really small (take a look at Versace’s take on the bumbag). There were even men’s clutch bags on the catwalk! 9. Bold colours. A contradiction to number 5, I know. 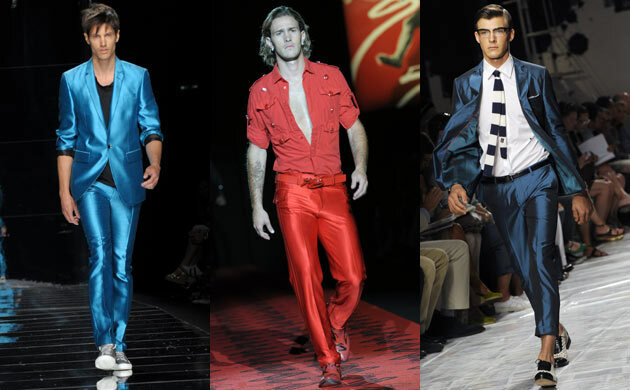 Some of the popular catwalk colours from the likes of Burberry, Calvin Klein and Gucci are bright reds, oranges, pinks and blues. 10. Shiny fabrics. Milan saw some bright, glossy jacket and trouser ensembles, as well as more casual outfits created by keeping just either the top or bottom half shiny. In a weird way I like this style, but I can’t help but think of Graham Norton. So, which of these styles will catch on in the highstreet fashion world?